Notification of AGM and GM have been sent to all members through email. Nomination form for the election of officers is also attached. Please download the form, fill in and return to the secretary via email or post. Looking forward to seeing you all at the meeting! 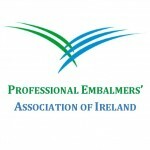 Welcome to the official website of the Professional Embalmers’ Association of Ireland. Thank you for taking your time to learn about us.